Enjoy family farm fun for all at Leaping Deer. 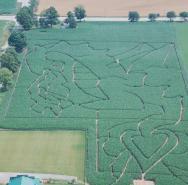 We have the largest maze in Oxford County as well as Wagon Rides, Mini-Golf, a farming museum, and even pig races. See one of our newest attractions, Shama the Llama and Carmella. So get away from the city and experience fun on the farm while building memories that your family will look back on for years to come.